1888 Carried out alterations to The Corner, Thursley, Surrey. 1889 Received the commission to design Crooksbury, Farnham, Surrey, for Arthur Chapman: left George’s office to set up his own practice; in May met Gertrude Jekyll at Littleworth Cross, who later introduced him to HRH Princess Louise and Edward Hudson of Country Life. 1893-1895 Builds Chinthurst Hill, Wonersh, Surrey for Miss Aemilia Guthrie. 1895-96 Designed and built Munstead Wood for Gertrude Jekyll. 1897 Married Lady Emily Lytton on 4 August 1897; designed and built Fulbrook, Elstead, Surrey; Berrydown, Ashe, Hampshire; Orchards, Munstead, Surrey; The Pleasaunce, Overstrand, Norfolk and many other buildings. 1898 Through Sir Herbert Jekyll, Miss Jekyll’s brother, he was commissioned to design the British Pavilion for the Paris Exhibition of 1900, which led to a new client in France, Guillaume Mallet, for whom he designed Le Bois des Moutiers at Varengeville. Also Goddards, Abinger, Surrey for Sir F. Mirrielees (wings added 1909-1910). 1899-1905 After 1900 his schemes became more varied: Deanery Garden, Sonning, Berkshire (1899); a ‘Wren’ exercise, the Country Life offices, Tavistock Street, London (1904); Neo-Georgian for Nashdom, Taplow, Buckinghamshire (1905). Alterations to two castles: Lindisfarne, Holy Island ( 1902) and Lambay, Ireland (1905). 1899 Builds Tigbourne Court, Witley, Surrey for Edgar Horne and St. John’s Institute, Tufton Street, London. 1900 Builds Homewood, Knebworth, Hertfordshire, for his mother-in-law, the Dowager, Countess of Lytton. 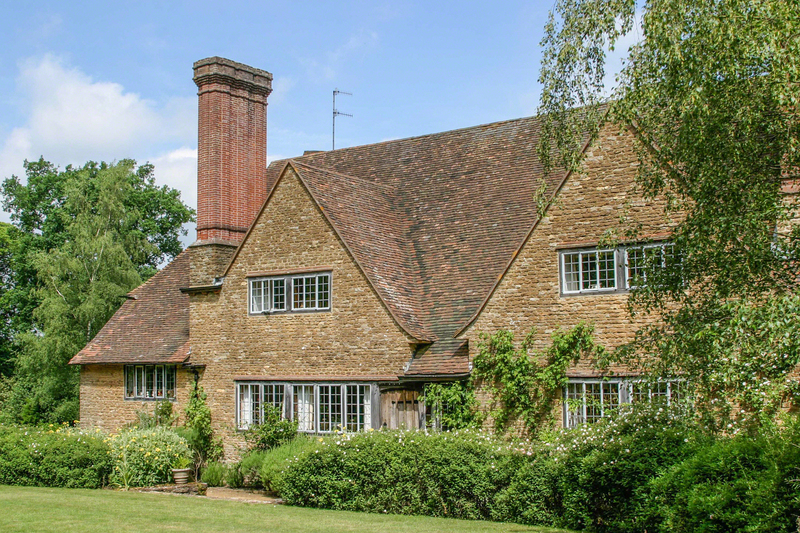 1901-1904 Builds Marshcourt, Stockbridge, Hampshire, for Herbert Johnson (1905 stables; 1924-1926 Great Room added). 1901 Builds Grey Walls, Gullane, for the Hon. Alfred Lyttelton. 1902 Builds Little Thakeham, Thakeham, Sussex for Ernest M. Blackburn and Monkton House, Singleton, Sussex for William James. 1903 Builds Daneshill, Basing, Hampshire, for Walter Hoare. 1904 Redesigns Ashby St. Ledgers, Northamptonshire, for the Hon. Ivor Guest (alterations, gardens and buildings on the estate 1904-1938). 1906 Builds Heathcote, Ilkley, Yorkshire, an exercise in Sanmicheli-classicism, Folly Farm, Sulhamstead, Berks, for H. Cochrane, New Place, Shedfield, Hampshire, for Mrs A. S. Franklyn, Offices for The Garden’, No. 42 Kingsway, London, for William Robinson, The Dormy House, Walton Heath Golf Club, Walton-on-the-Hill, Surrey, for G. A. Riddell and Barton St. Mary, East Grinstead, Sussex, for Sir G. Munro Miller. 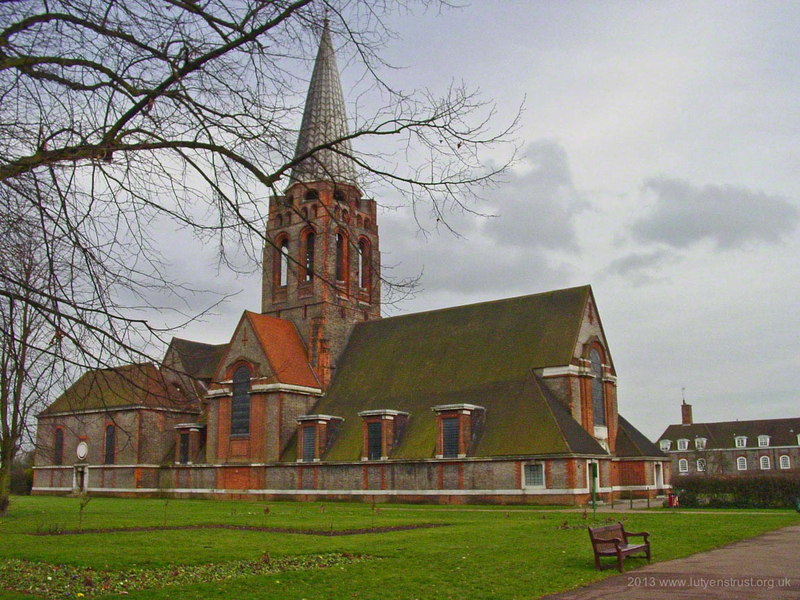 1908 Appointed architect for Hampstead Garden Suburb, where he designed the houses and civic buildings of the central area, St Jude-on-the-Hill and the Free Church. Built Temple Dinsley, Herts (enlargement) for H. G. Fenwick, Middlefield, Stapleford, Cambridge, for Henry Bond, Whalton Manor, Northumberland (remodelling), for Eustace Smith and Chussex, Walton-on-the-Hill, Surrey, for W. H. Fowler. 1909 Built Great Maytham, Rolvenden, Kent, for H. Tennant. 1909 Appointed consulting architect to the Royal Commission for the International Exhibition at Turin and Rome: Lutyens’s Royal Pavilion at Rome (1911) became the British School at Rome. 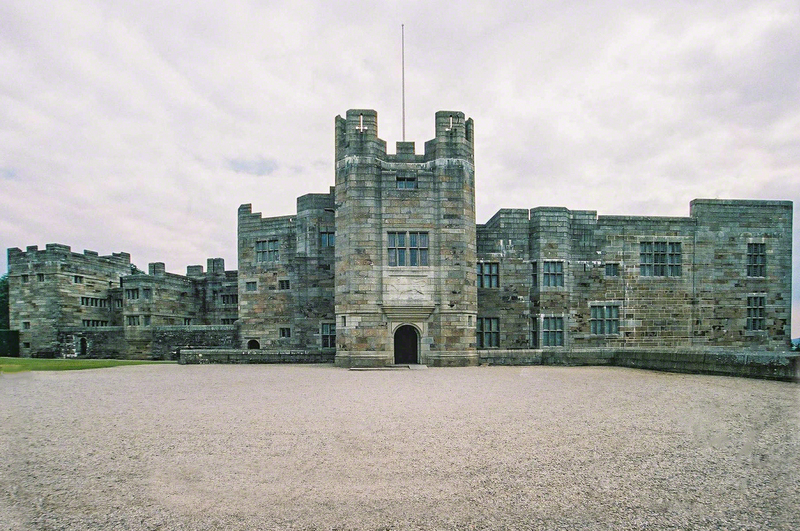 1910-32 Castle Drogo, Drewsteignton, Devon for Julius Drewe. 1911 Built The Salutation, Sandwich, Kent and No. 7, St. James’s Square, London, for Henry Farrer, No. 36 Smith Square, London, for the Rt. Hon.Reginald McKenna, Theosophical Society’s Headquarters, Tavistock Square, London (B.M.A. 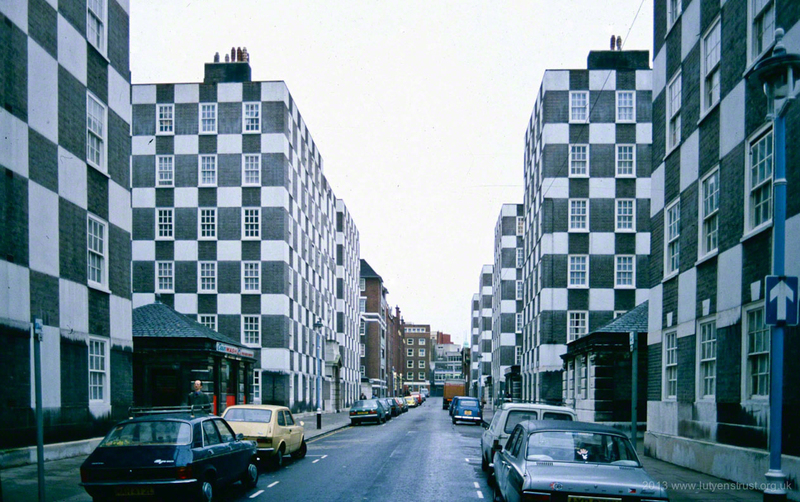 ), The Corner House, Cowley Street and No. 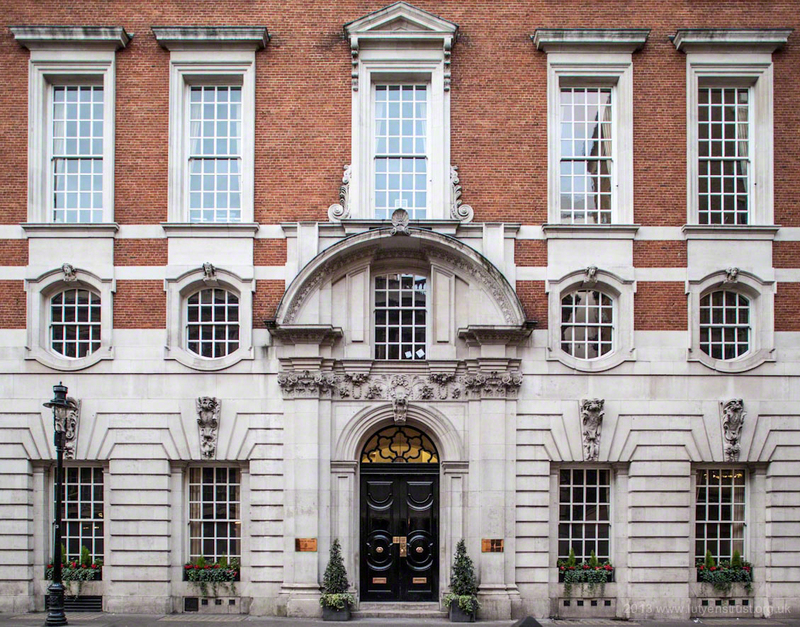 8 Little College Street, Westminster, London for Lady Norman and the Hon. F. Maclaren. 1912-1916. Additions for Folly Farm, Sulhamstead, Berks for Zachary Merton. Built Ednaston Manor, Derbyshire, for William G. Player, Johannesburg Art Gallery and British School, Viale della Belle Arti, Rome. 1912 Elected a member of the Delhi Planning Commission. and set sail for India on the first of nineteen journeys there, on 28 March, to investigate the site and plan of the new city. Began designs for Viceroy’s House, New Delhi, India (also Viceroy’s Court, fountains etc). 1913 Elected Associate of the Royal Academy In January formally appointed joint architect for New Delhi, with Herbert Baker – Lutyens to design the Viceroy’s House and Baker the Secretariats. 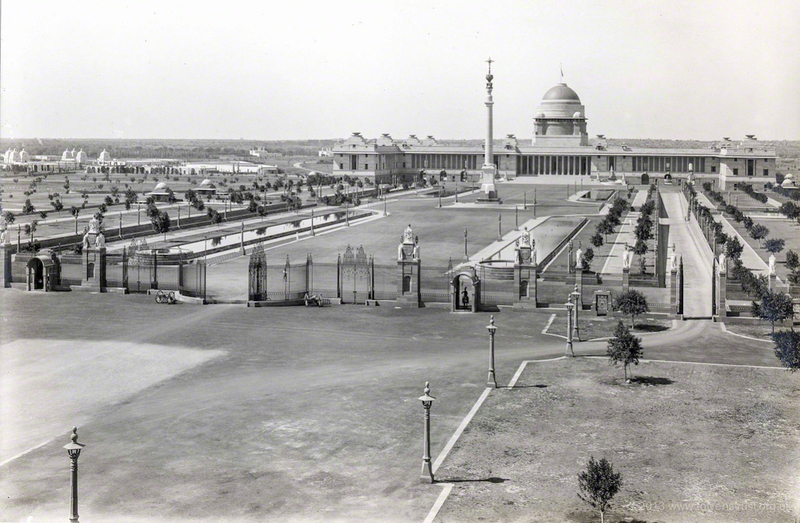 New Delhi was inaugurated in 1931. Built Abbey House, Barrow-in-Furness, Lancashire for Messrs Vickers. 1917-18 Appointed one of three Principal Architects to the Imperial War Graves Commission, with Herbert Baker and Reginald Blomfield. Designed The Great War Stone (1917); Etaples Military Cemetery (1919); Memorial to the Missing and Cemetery, Faubourg d’Amiens. Arras (1924-25); Memorial to the Missing of the Somme, Thiepval (1926-27) and the Villers-Bretonneux Military Cemetery, Somme (c.1927-38), as well as many other cemeteries in France. 1918 Knighted for his work at New Delhi. 1919 Invited by Lloyd George to design a temporary catafalque for the peace procession on 19 July in Whitehall: Lutyens designated it a ‘Cenotaph’. It was immediately acclaimed and re-created in Portland stone on the same site in 1920. 1920 Elected Royal Academician. Britannic House in the City, for the Anglo-Persian Oil Company, was the first of many post-war commercial commissions in London including buildings for the Midland Bank in Piccadilly (1922), Poultry (1924-39) and Leadenhall Street (1928); Grosvenor House, Park Lane (elevations only, 1926-28); No. 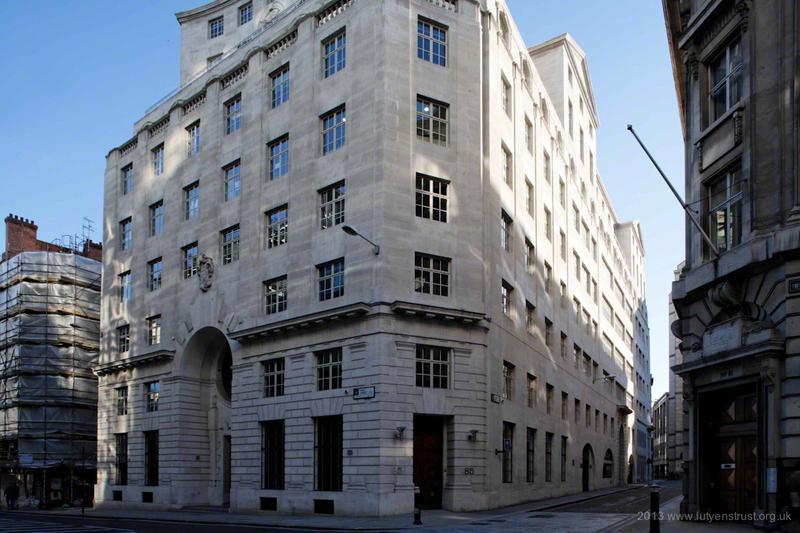 68 Pall Mall (1928-29): No. 120 Pall Mall (1929-31) and Reuter’s, 85 Fleet Street (1935). Built All India War Memorial Arch, New Delhi, India. 1921 Awarded the Royal Gold Medal by the Royal Institute of British Architects. Work began on HM Queen Mary’s Dolls’ House, which Lutyens designed and co-ordinated. 1922 Reconstructed Ashwell Bury, Ashwell, Herts for Mrs H. Fordham. Designed Theosophical Society (now BMA), Tavistock Square, London. (1922-29). 1924-25 Vice-President of the Royal Institute of British Architects. In 1924 he was awarded the Gold Medal of the American Institute of Architects and became a member of the Royal Fine Art Commission. 1925 Built Mells Park House, Mells, Somerset for Rt. Hon. Reginald McKenna. 1925-1927 Built Gledstone Hall, Yorks for Sir Amos Nelson. 1926 Designed garden and two pavilions, Tyringham House, Tyringham, Bucks for F. A. König. Built Palace for the Nizam of Hyderabad, New Delhi, India. 1927 Remodelled manor house, gardens, bridge, lodges and made alterations to Mill Cottage at Plumpton Place, Plumpton, Sussex for Edward Hudson. Built British Embassy, Washington. 1928 Built Flats in Page Street and Vincent Street, London, for the Westminster City Council. 1929 Built British Industries House and Hereford House, Oxford Street, London for Gamage’s (elevations only) and Midland Bank, King Street, Manchester. 1929 Commissioned by Richard Downey, Archbishop of Liverpool, to design a new Roman Catholic Cathedral. The Foundation stone was laid on 5 June 1933 and work began on the Crypt, but stopped in 1941. 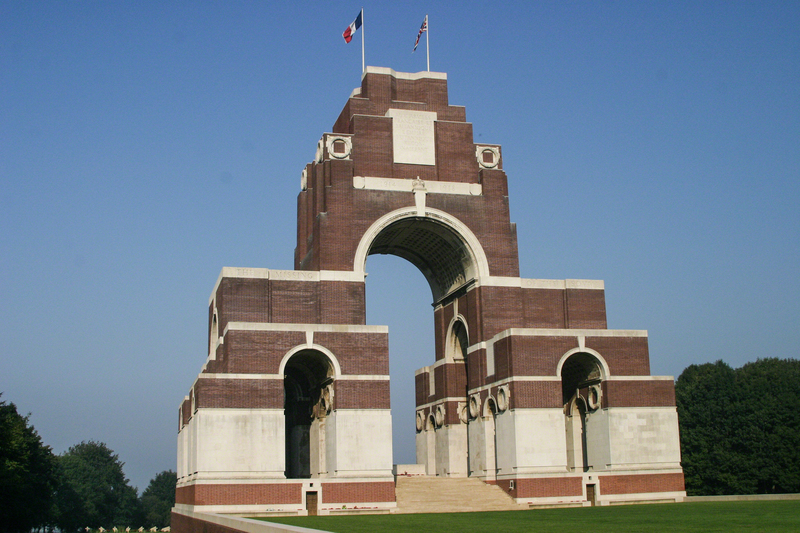 Lutyens’s scheme was later abandoned. Sir John Summerson has called his design ‘an architectural creation of the highest order, perhaps the latest and supreme attempt to embrace Rome, Byzantium, the Romanesque and the Renaissance in one triumphal and triumphant synthesis’. 1930 Created Knight Commander of the Order of the Indian Empire. Built the YWCA Central Club, Great Russell Street, London, and designed layout, bridges and lodges for Runnymede, Surrey. 1935 Built Campion Hall, Oxford and Reuter’s and Press Association, Fleet Street, London. 1937-1939 Designed Admiral Beatty and Admiral Jellicoe memorial fountains, Trafalgar Square, London. 1938 Elected President of the Royal Academy. Built Middleton Park, Oxon for the Earl of Jersey and Halnaker House, Halnaker, Sussex, for the Rt. Hon. Reginald McKenna. Australian Memorial at Villers-Bretonneux completed. 1939-42 Worked on the Royal Academy Plan for London. 1942 Awarded the Order of Merit – the first time an architect had received this honour. 1941-1943 Worked on re-planning of Kingston-upon-Hull with Sir Patrick Abercrombie. 1944 Died on 1 January at No 13 Mansfield Street. Ashes and memorial tablet (designed by his friend William Curtis Green) on south wall of OBE Chapel at St. Paul’s cathedral. This is compiled from other lists taken from ‘Sketches by Edwin Lutyens’ by Margaret Richardson, ‘RIBA Drawings Monograph No.1’ published by Academy Editions 1994 and taken from ‘Lutyens, the work of English Architect Sir Edwin Lutyens (1869-1944)’ Exhibition Catalogue, edited by Colin Amery and Margaret Richardson, The Arts Council, 1981.